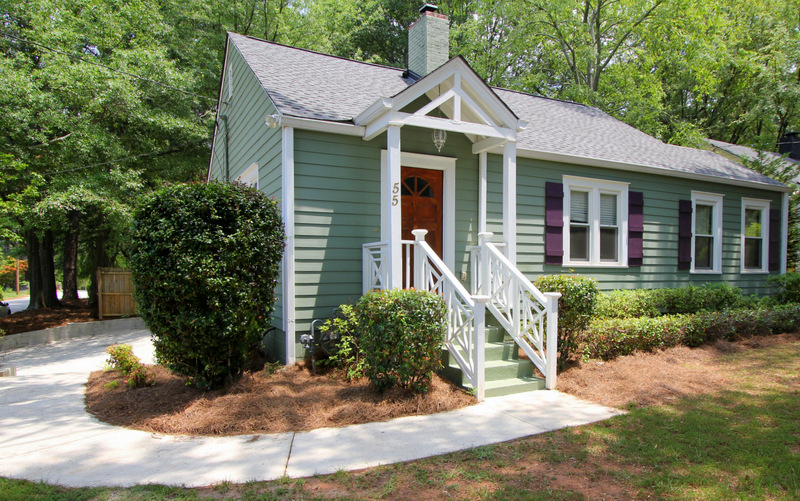 Located in the historic East Lake neighborhood in City of Atlanta, 55 Candler Road NE is a 3 bedroom 2 bath renovated cottage sitting on an oversized corner lot with side entry/off street parking. The kitchen has been totally remodeled with solid granite counters and soaring cathedral ceilings. There is a a wood entertainment deck off the back and a large, fenced backyard. According to the owners the home is about 1650 square feet. What sets this home apart from others in the area is it was built on a large CORNER lot. A less discerning buyer might mistakenly discount this home because of the busy Candler Road address. But you know a large corner lot like this one is rare find -- allowing for ample off street, side entry parking. So you get the benefit of an excellent location without the hassle of dealing with busy traffic. Because this home sits just outside sought after Oakhurst neighborhood boundaries in East Lake -- you get the benefit of a close-in, walkable location without the added expense of those hefty City of Decatur taxes. A perfect home for buyers who want to be in Oakhurst but don't need the City services. Here's what you'll notice when you first walk in: Good energy and natural light flow into every corner of the home. The focal point of the living room is the gleaming hardwood floors & the wood burning fireplace. For the chef in the family - the kitchen boasts solid granite countertops, wood cabinets, sleek black appliances and a breakfast bar - the perfect spot to enjoy a cup of coffee in the morning as you prepare for the day ahead. Do you like to entertain? You'll fall in love with the formal dining room which opens naturally to both the formal living area in the front and the kitchen. Comfortably seats 6 - perfect for a dinner party with friends and family. In the back you’ll find a wood entertainment deck & a 6ft wood privacy fence enclosing the large, level backyard. Centrally located just minutes from everything Atlanta - including Downtown Decatur, Midtown & Buckhead.